"This is a simple pan-fried tilapia with a reduction sauce. It's great served over rice or pasta." Mix together 1/4 cup flour, Parmesan cheese, thyme, dill, and salt in a shallow dish. Pour 1/2 cup milk and 1/2 cup flour in two separate shallow dishes. Dip tilapia fillets into plain flour, then milk. Thoroughly coat the fillets with the seasoned flour; reserve the remaining seasoned flour. Melt butter in a large skillet over medium-high heat. Brown the fillets in the butter, about 2 minutes each side. Reduce heat to medium-low and continue to cook until the fish is easily flaked with a fork, 2 to 5 minutes more. Transfer the fillets to a dish. Increase heat to medium, and pour the remaining seasoned flour into the skillet. Whisk in white wine; cook and stir until reduced and thickened, about 5 minutes. Gradually stir in 1/4 cup milk. Reduce heat to low and allow sauce to simmer for 1 or 2 minutes more. 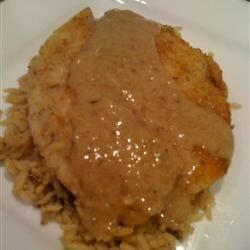 Spoon sauce over tilapia to serve. just made this and thought that it was quick and fabulous! served with sauteed spinach, onions and garlic. A new fav! Thanks for sharing! I left out the dill since neither my wife or I are that fond of it and we both love this.. I'm going to experiment with the recipe and different wines just for fun. Very tasty, but needed to add much more milk to get anything like a 'sauce' consistency.